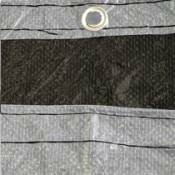 The PoolTux King In Ground Winter Cover is an 8 mil Silver on black triple laminated polyethylene cover with heat sealed seams for added strength. The edges incorporate a sewn-in polypropylene cord for reinforcement. Aluminum grommets are located in each corner and there are 2 inch x 12 inch water tube loops spaced every four feet. This cover also has a 6 foot overlap instead of the normal 5 foot which helps to insure a better fit. This Cover has a 15 year limited warranty; 3 Years Full. 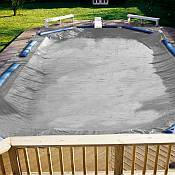 One of the best polyethylene Winter Pool Covers.